Cleansing and relaxing. No EDTA, mineral oils, parabens, silicones. No synthetic fragrances or colours. No phthalates, propylene glycol and carbomer. Non GM. Certified organic ingredients.Soothing pure organic lavender essential oil infuses pure, naturally cleansing French sea salt to purify, relax and unwind Our beautifully scented French lavender essential oil comes from the Drome region, renowned for growing high quality lavender, while our naturally purifying sea salt comes from the bay of Brittany in France, where the traditional salt harvesting methods are part of an ecological project that has transformed neglected swampland into an important wildlife wetland. A lovely thought to drift away to. 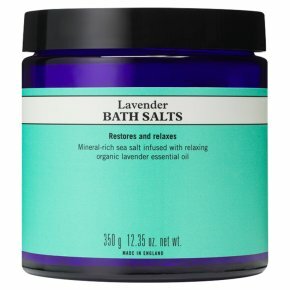 Directions: Add two generous scoops to a warm bath, sink in and relax.